News shocked the theater and entertainment circles in the Philippines, Singapore and Australia. 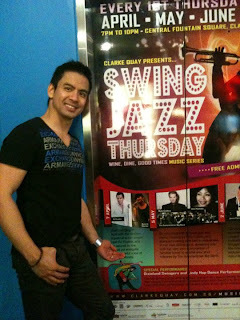 RJ Rosales, Filipino-Australian singer, actor and thespian dies in Sydney, Australia on December 5, 2011. He was 37. Roseo Jose “RJ” Rosales (March 24, 1974 – December 5, 2011) finished a BS degree in Mathematics from the University of Western Sydney and worked as a banker in Australia. RJ had his first break in show business when he joined the cast of the Australian production of Miss Saigon in 1996 as part of the ensemble. Because of his enormous talent in musical theater, RJ then continued his career in theater in Singapore and Australia where he was cast in several productions including Chang and Eng The Musical, The Student Prince, Man of Letters, Cabaret, Forbidden City, Beauty and the Beast, Into The Woods, Sisa, Her Son, Jose Rizal, and in I Love You, You’re Perfect, Now Change. He also made numerous television appearances in Singapore that included Spin and Style Doctors. RJ was a mainstay in A.S.A.P., a musical variety show on ABS-CBN Channel 2 (Philippines) from 2001-04. In 2005, he earned a nomination as Best Supporting Actor for his performance in Blue Moon, which was awarded as Best Picture in 2005 Metro Manila Film Festival. When RJ moved back to Australia in late 2007, he was cast as Thuy (also as Engineer in a separate production) in Miss Saigon and earned him as Best Supporting Actor in a Musical at the Helpmann Awards (the Australian equivalent of Broadway’s Tony Awards) in 2007. His music influences include James Ingram, Anthony Warlow, Michael Ball, Martin Nievera, Lea Salonga, Mariah Carey and Whitney Houston. In 2004, I participated in the Musical Theater Workshop of Tanghalang Pilipino where Roy Rolloda (for acting) and Mia Bolaños (for singing) became my teachers. And I'm proud to say that I was one of those lucky students who have learned so much in the workshop under them. As we were preparing for our recital, Roy showed to us his CD Soundtrack of Chang and Eng The Musical of which he co-starred with RJ Rosales - RJ as Chang & Roy as Eng. He briefly shared to us his stint in that musical's second run in Singapore and let us listen to one song. It was brilliant! Ever since first year high school, I already had the biography book of Chang & Eng and have read how popular these Siamese Twins were and how they have lived their lives. And because of Sir Roy (which I would always call him), I have learned that there was a Chang & Eng musical, and that he, as our teacher, was a co-lead in that big production. I know RJ Rosales from ASAP (ABS-CBN Channel 2). He was one of those artists I looked forward to (seriously) on the show every noon time Sunday. His voice was always fresh and powerful. I can't help but shed to so much tears how a young, extremely talented young man and kind soul be gone too soon. I have not cried for Michael Jackson and other performing artists during their untimely demise but I become so emotional everytime I remember RJ's magnificent voice and watch his performances on YouTube. I still cannot imagine (and accept) that he's really gone now and that meeting him in person would be nil and irrevelant. However, his memories will forever live in the hearts and minds of his 3 F's - family, friends and fans. RJ, your HOME is MUSIC & THEATER. You live in the hearts of everyone who admires your talent to the nth degree! RJ and I had communication on Facebook and in another social network site (I shall call "Spring") since early 2010 - that's how an avid fan and follower I am of him! Since then we became online friends. But when I checked my account in "Spring" recently, it's strange that we're not connected anymore. I think it was a technical glitch when "Spring" has changed its interface design several times. My original 500++ friends in 2003-04 became 93 only now. RJ currently has 35 friends left (I wonder what happened to his followers there?). Perhaps many have already deleted their "Spring" accounts for Facebook. Sadly, the messages that RJ & I have exchanged on "Spring" were all gone too. RJ's last login on "Spring" was on November 19, 2010. I also believe that not all messages on Facebook were stored before (especially if those were done on chat). I still remember the few things we have discussed and shared briefly on "Spring" and Facebook. RJ sent me the following messages and these are the only ones I can access and view from my account. This was RJ's first message to me on Facebook dated July 26, 2010. The attachment below his message was actually a link to his fan page, of which I told him I was already a "member" for quite sometime. It's strange that the fan page is now gone and inaccessible. RJ Rosales - "The Prayer"
There will be a funeral service (mass) scheduled on December 10, 2011 at 10:30 am at St. John XXIII Parish Church in Stanhope Gardens. Interment follows at 12:30 pm at Pine Grove Memorial Park at Kingston St., Minchinbury, Western Sydney, Australia. Family and friends of RJ in Singapore have organized a eulogy service in honor of him - Celebrating RJ Rosales. This will be held on December 12, 2011 from 6:00 to 10:00 pm at Kallang Theatre, Reception Room at 1 Stadium Walk. Details here. "I have worked with RJ when I was new in the business. I just won in the Voice of Asia competition and I was offered a role in a musical called East Meets West (2003) staged at the Cultural Center of the Philippines. RJ was one of the cast members. I remember sharing the dressing room with him and me, being a newbie, was always quiet. He'd approach me and made me feel at home in the theater (being the theater actor that he was). We'd exchange ideas and tips on singing and performing. He was the pro, I was a newbie. He will remain one of the very first few friends I have made in show business and he will always be remembered." "I first met RJ in Singapore in 2001 when my wife Ayen & I watched him along with other Filipino Artists in the musical Chang & Eng. When he moved to Manila in 2002, we worked together in ASAP and other concerts and shows in Manila and out of town. During his time here, we got to know each other and I found him to be a really nice guy who is extremely talented. I am very honored to have known him and to have worked with him. The last time I saw RJ was when we had lunch in 2005. We communicated through Facebook when he moved back to Australia and Singapore. I am still in shock that he is gone. Rest in peace, my friend." "RJ and I have worked together in 2000 in Singapore for Chang and Eng The Musical for Action Theatre Singapore for 3 months. We were not very close but he was always very nice." "RJ and I have worked together in Singapore for Chang and Eng. He's very professional. He would always laugh at jokes and in every show I get to beat him up in Act One being the contrabida... And in Act Two, I would always make him laugh during the surgery scene as one of the doctors. I always tickled him all through out the whole number. Sheila Francisco was part of the show. Noel Rayos was RJ's understudy. All i can do right now is to really pray for him that he may find peace." RJ Rosales - "Come Fly With Me"
RJ, you and your music will be missed! Come Fly With Me!